I have always been fascinated with the tools that people use to accomplish their work. I love, for example, spending time at my friend Clint’s saddle shop studying and making photographs of the old tools he uses to craft his world-class saddles. And as a photographer, I certainly have my share of tools—from a cutting edge, Nikon high mega-pixel digital camera—really a computer of sorts—to a set of rare Carl Zeiss Protar view camera lenses, crafted by hand in Germany nearly a century ago. LARRY LATTMAN is a retired geologist with an illustrious career that includes college professor, petroleum geologist, college dean and even university president. He’s ninety-one now and I am proud to say that he is my good friend. We first met at a photography workshop I was teaching for Ghost Ranch years ago. Then twenty years later we met up again at another workshop, one I was teaching for Eloquent Light. Since reconnecting, we have spent a fair amount of time making photographs together, talking about life and also discussing in great detail the subtleties of how the land we live on was formed. During our conversations, I am struck by how deeply and carefully he sees the world; particularly the little piece of it we share here in New Mexico that is so different from the place of his birth—New York City. While he would say that he is only a photographer of slopes, his self-deprecating comment only scratches the surface. His photographs are informed by his fascination with geomorphology, a branch of geology that studies the mechanics of how land is formed. And yet there is a piece of the artist in this geologist as Larry so admirably demonstrates in the photographs he makes. His images reveal an understanding and a beauty about the landforms he knows so much about. Because of my fascination with fine and interesting tools and what they say about the people who use them, I asked Larry not long ago if I could examine some of the equipment he used over his long career as a working geologist. Out of a cupboard drawer filled with various geologic samples, he pulled out his well-worn geologist leather field belt that held among many things, his rock hammer, notebook, compass and other tools of the trade. 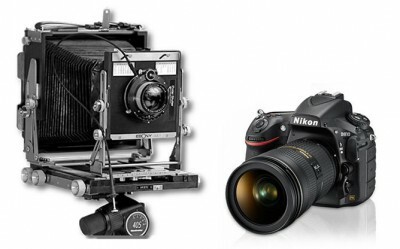 The implements of a geologist are simple and even basic when you compare them to the latest digital camera gear. In a very real way they may be considered “old school” yet they are quite effective for the work they are intended. I asked if I might make a photograph of his tools and Larry agreed to loan them to me. The image at the beginning of this missive, a still life made on an overcast day on the dunes of White Sands National Monument, is not only a photograph of the tools of the geologist, it is a portrait in a very real way of the geologist himself. We live in a world of synchronicity, where dynamic and meaningful coincidences take place in ways and on a frequency that suggests they are not simply random events but rather a deeper expression of a much subtler order. Dr. Lattman began his teaching career at the University of Michigan in the 1950’s after graduating with a Ph.D from the University of Cincinnati. In one of the very first geology classes he taught at Michigan there was enrolled a freshman engineering student determined to make good. His name was Suren Varjabedian. He was my father. I find myself in awe. When coincidences happen in this way, one cannot help but being impressed by them. Life seems to have endless circles—like continuous ripples on the surface of a pond—where people and events intersect and come back around and new/old connections are made. Events such as these are reassuring in a way, as they connect us across time and distance and confirm (at least for me) that we are indeed part of something much greater. I want to believe that Larry and I were destined to meet, a process set in motion all those years ago when my father sat in Dr. Lattman’s classroom in Ann Arbor and listened—spell-bound I am sure as I so often am—while the good professor shared his vast knowledge, enthusiasm and even love for the beauty of this planet. I only know that these “coincidences” happen ever so frequently in my life and perhaps they happen in yours too. I know that I am forever grateful.